Veteran international startup attorney and avid traveler Jennifer Hill co-founded a new venture this year, Sixty Vocab, an interactive online tool that helps people learn foreign languages, based on the concept that if you learn just 2,000 words, you can speak 60 percent of your new tongue of choice -- more than enough to get by. Multilingual herself, Hill resides in Hoboken, New Jersey. But with a globetrotting husband (and enduring months of renovation at their home), she decided to set up shop in Strasbourg, France, for five months, where her husband is working, with plans to come back in August. Hill still travels frequently back and forth. But with a precocious toddler named Simon in tow and another baby on the way, she’s been forced her to rethink her years-in-the-making travel routine. "Simon would have gold status, if he were eligible to earn miles,” she jokes. “Our second should be ready for elite status at birth." So what does a busy mompreneur, who still racks up a "mere" 50,000 to 75,000 miles a year, carry with her? Just let her check her spreadsheet. Her ingenious system, a recommendation from fashion designer Jean Yu, helps her track what she wore and didn’t on the plane ride home. "It takes less than five minutes and makes packing for future trips lightning fast." With that in mind, during a chat from her adopted hometown in France, we asked Hill to share her latest packing list. Jennifer Hill, co-founder of Sixty Vocab, a language learning tool, runs her business while dividing her time between two continents. 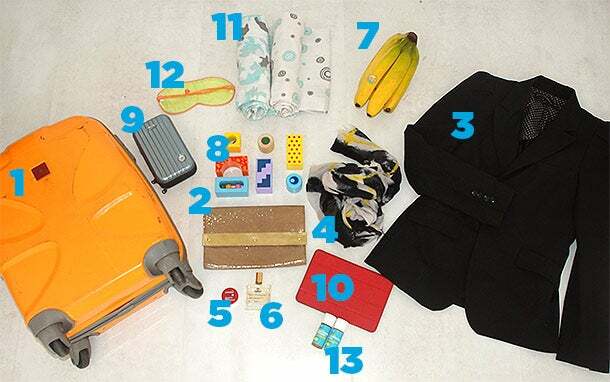 She often travels with her young son and she explains what she carries with her to make it work. 1. Orange Monster. "This Titan wheelie represents my PhD in packing. Prior to our first child, I used only this suitcase for a three-week trip to Morocco, Greece, Italy, and Portugal. Now it’s my go-to bag for non-winter travel. It forces packing smartly, sneaks on the plane with my purse and diaper bag, and there is never bag confusion." 2. Clutch purse. "It's important to be prepared for evening events during travel, so a clutch purse doubles as my wallet/passport holder. This gold one was a gift from my friend Sandrine.” [Sandrine Murcia is the chairwoman of Paris Pionnieres, a network and incubator for women entrepreneurs in Paris]. 3. Zara black blazer. "I have two of these and they instantly dress up any outfit and make me look ‘SFU’ -- suitable-for-upgrade." 4. Zara scarf. "When I pack, I select a color palette to ensure that I’m well dressed using few pieces. Black, white, and yellow are my favorites, so this scarf is perfect. It adds a bit of warmth on the plane, dresses up most outfits so that I don’t have to mess with jewelry, and acts as a sarong in a pinch." 5. Korres Lip Butter in Wild Rose. "It’s the perfect shade of red, glossy, goes with everything -- and doubles as lip balm and blush. It’s 100 percent organic, too." 6. Nuxe Body Oil for Face, Body & Hair. "This is the best body oil ever and triples as lotion, face cream, and hair products. It reminds me of wonderful summer vacations on European beaches." 7. Bananas. "They are the perfect snack for my son and me throughout the flight." 8. Blocks. “These Eichhorn German blocks were a gift from Simon’s aunt. Easily packed in a Ziploc bag, they are the perfect size for seat-tray playing." 9. Rimowa travel box. "This is the in-flight menities container from Lufthansa first class (courtesy of my husband). It’s super light, indestructible, and tidily organizes small things like my lip balm, jump drive, eye mask, and earrings." 10. iPad Mini. "Now that I regularly do transatlantic flights with my son, the iPad is critical. I load it with age-appropriate games and programs. My husband is from the U.K. and got Simon hooked on a ‘70s British cartoon called Mr. Benn -- that’s his favorite. It also holds the Kindle app for my books." 11. Anais & Aden swaddles. "Thankfully, my son doesn’t have just one blankie -- any of these muslin swaddles will do, because he likes the feel of them. The muslin is really light and soft and breathable and they’re a good size for a child. There are always two in the diaper bag." 12. Eyemask. "Ever since living in a sundrenched Chicago apartment, I’ve become addicted to them for a good rest. All of mine are from airlines. My favorite has a bigger surface area and a Velcro closure." 13. Better Beauty Products. "I bring at least one nice tiny travel bottle of shampoo/conditioner. When I have it, my hotels always end up having nice beauty products. If I forget it, karma ensues -- and I end up with the hair version of Windex. Better to be prepared."